We’d love your help. 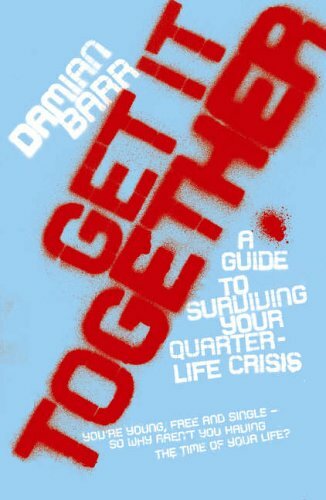 Let us know what’s wrong with this preview of Get it Together by Damian Barr. To ask other readers questions about Get it Together, please sign up. This book helped me a lot! There are a lot of differences from the US to the UK but there are also a lot of similarities. I think everyone suffering through their quarter life crisis needs to read this, just for the hell of it. Just to know that other people out there are struggling too. One of good references for how to get through the quarter life crisis. "Get it Together" before its too late. You decide. Whilst my twentysomething crisis went to the other way round. All was great. Glad to hear the bewildering time post-uni is not soley the condition of this English Lit student. 'You Will Be Safe Here' is set in South Africa in 1901 and now. It explores legacies of abuse, redemption and the strength of the human spirit - there is always, light even in our very darkest moments. 'South Africa, 1901, the height of the second Boer War. Sarah van der Watt and her son are taken from their farm by force to Bloemfontein Concentration Camp where, the English promise: they will be safe. 'Maggie & Me' is my memoir of surviving small-town Scotland in the Thatcher years. It won Sunday Times Memoir of the Year: "Full to the brim with poignancy, humour, brutality and energetic and sometimes shimmering prose, the book confounds one's assumptions about those years and drenches the whole era in an emotionally charged comic grandeur. It is hugely affecting." BBC Radio 4 made it a Book of the Week. Following Jeanette Winterson in 2012, Stonewall named me Writer of the Year 2013. I host my own Literary Salon at the Savoy. Guests include: Jojo Moyes, Bret Easton Ellis, John Waters, Mary Beard, James Frey, David Nicholls, Colm Toibin, Taiye Selasi, Susan Calman, David Mitchell and Rose McGowan. Do enjoy our podcast! Commended as Columnist of the Year, I've also been a journalist for over a decade writing mostly for The Times but also the Independent, Telegraph, Financial Times, Guardian, Evening Standard and Granta. I'm currently a columnist for the Big Issue and High Life. My first book, based on a Times column, was published by Hodder in 2005. 'Get It Together: A Guide to Surviving Your Quarterlife Crisis'. I've also co-written two plays for Radio 4 and appeared on PM, Midweek, Broadcasting House and Today as well as The Verb and presented on Front Row.